Your heart begins to race, your hands are clammy and shaky, your head is spinning and your breathing is slow and inconsistent. You look over and see all the stacks of books and mounds of homework you need to complete, but you can’t bring yourself to do it. Instead, you go for a run, play some video games, you even clean your room. You do anything to avoid buckling down and starting your assignments. Many of us find ourselves scattered in moments of stress, we try to take on too much at once because we think we can, I mean, we are college students after all. But for some, multi-tasking is a struggle. They get distracted easily, can’t focus and sit still — they have Attention Deficit Disorder or Attention Deficit Hyperactivity Disorder. ADD is the second most common mental disability among college students and other young adults, according to the Journal of American College Health. According to the Child Mind Institute, these students may have difficulty managing their classes, studying for exams and maintaining a social life due to not having that day-to-day structure they once had in high school. Aaron Krasnow, Ph.D., associate vice president of ASU Counseling and Health Services, says less structure can be challenging for most people, including those without ADD or ADHD. ADD is a biologically based condition that includes any range of behavioral disorders, according to ADD.org website on ADD. ADHD is a biological condition characterized by symptoms centered around a person’s inability to focus on a task, avoiding such tasks and becoming easily distracted, according to Psych Central’s website. 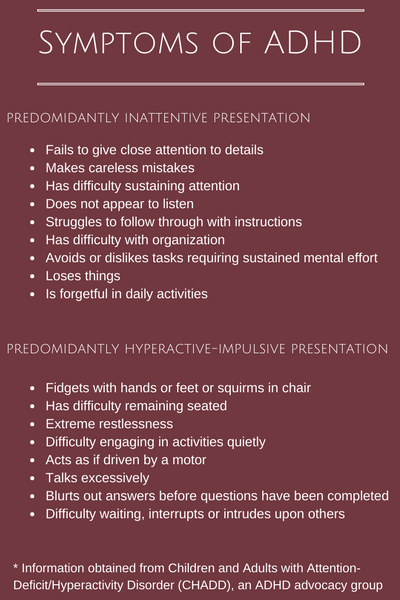 A person may either be diagnosed with ADD or ADHD depending on whether they are hyperactive or not. The difference between the two is quite simple: ADHD includes the symptom of physical hyperactivity or excessive restlessness — that’s the “H” in ADHD. People with ADD can actually be calm, the symptom of hyperactivity is absent, according to Dr. Hallowell, author and world-renowned ADHD expert. Oftentimes, the diagnosis of ADD is missed because of the absence of hyperactivity. People may just assume you’re shy or even slow. Krasnow says ADD or ADHD can present some challenges to students, often in terms of attention, concentration or information retention. Victor Wright, a sophomore hotel management and tourism major, says he was diagnosed with ADHD in fourth grade. He says having ADHD has not greatly affected his academic career but that he is doing much better his sophomore year than he did his freshman year. Although he said he didn’t put much effort to succeed his freshman year, he doesn’t think it was his ADHD — rather a lack of trying. “Adjusting to college wasn’t too difficult for me. At first it was a little but I learned to manage and get the hang of things,” Wright says. ASU Health Services and Counseling Services can provide direct service to students with ADD or ADHD in the form of counseling, workshops and medication management when appropriate, Krasnow says. According to Modern Medicine Network, those with ADHD might have a harder time adapting when they enter into college life. This can lead to higher dropout rates among students with ADHD than among those without this disorder. 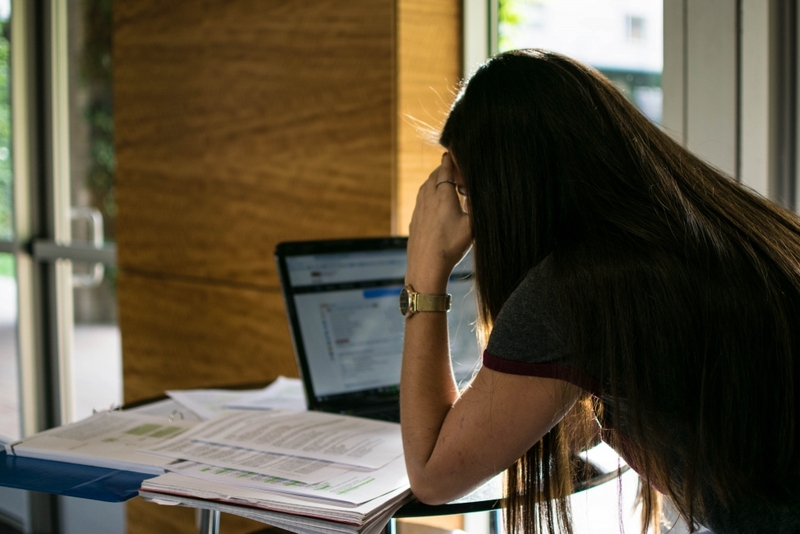 “When students are having difficulty we recommend they work closely with the Disability Resources Office so they can get accommodations to ensure that there is no negative impact of their symptoms on their academic success,” Krasnow says. Max Bartolomea, ASU sophomore medical studies major, was diagnosed with ADD when he was 7 years old. He says his second grade teacher recommended he get tested after she noticed he had trouble paying attention in class. Bartolomea is on medication for his ADD. “I can honestly say that without medication, I would not be able to be a high-functioning college student,” Bartolomea says. Bartolomea says when he is unmedicated, going to class is pretty much useless. “During these rare times, I find myself zoning out every 30-seconds and even when I am focused, I am focusing on the wrong thing,” Bartolomea says. Bartolomea was given accommodations for his ADD in high school, like getting extra time on tests and leniency for forgetting assignments, but he says he didn’t apply for those accommodations at ASU because he didn’t want others to think he needed it. “I believe I was able to succeed through adjusting to the college lifestyle because of my work ethic rather than my physical work ability,” Bartolomea says. 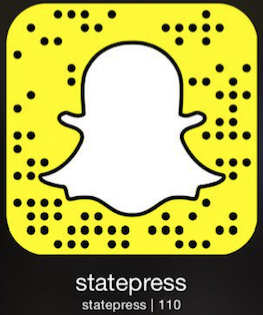 Reach the reporter at Antonina.North@asu.edu or follow @NinaANorth1 on Twitter.